If learning first-hand about the U.S. government while interning in Washington, D.C. (or Austin during a legislative year) sounds like a great way to spend a semester, then North Texas in D.C. (NTDC) program is for you. The North Texas in DC (NTDC) Internship Program was established in 2003 by Associate Vice Chancellor for Government Relations & Chief Policy Operations Officer Rey Rodriguez and Vice President for Student Affairs Elizabeth With in order to give University of North Texas students the opportunity to connect with distinguished internships in our nation’s capital. The program was later expanded to include opportunities in Austin, Texas during alternating Spring semesters. NTDC has provided for nearly 200 UNT students, who have traveled to DC or Austin, to intern for various government entities. Some students have used their experience to launch a career of their own while others have benefited from the internship by applying their experience to law school or graduate school. 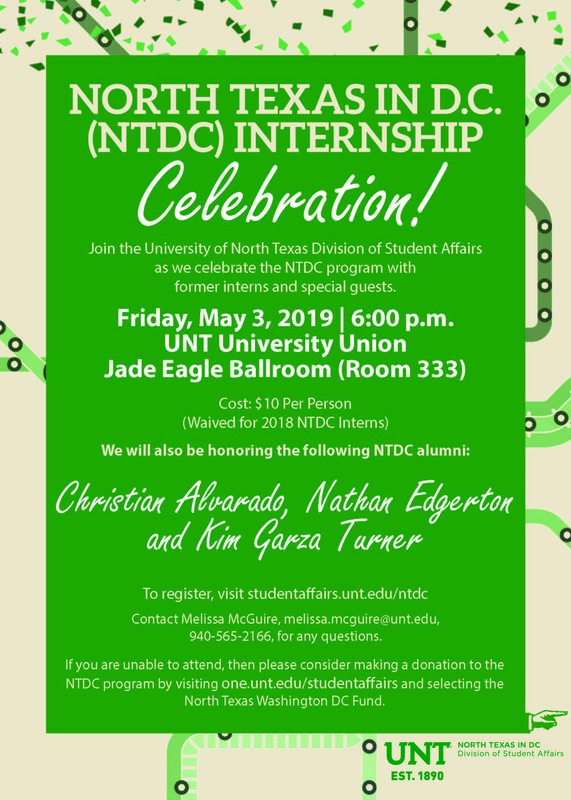 The NTDC internship program provides University of North Texas students the opportunity to experience the American governing processes first-hand, and development through professional work experience. Students learn how various national entities formulate public policy and how other governmental agencies, programs, and private organizations interact with that process. Internships are available to students every Fall and Spring semester. Interns work full-time and are unpaid for the duration of the semester for which they are chosen. The program’s objective is to provide students with insights into public life and the policy-making process by working in governmental, nonprofit, and private sector internship placements in our nation’s capital. Through NTDC, UNT students can directly apply their learning in the classroom to real-world professional contexts. Students are primarily placed in Congressional internships with occasional placements in non-profits or public policy groups. A key component of the NTDC program is that all housing costs are paid for. Each semester, NTDC places students at a housing site that is chosen by the program administrators. NTDC primarily works with WISH (Washington Intern Student Housing) to accommodate the interns. This housing scholarship is awarded to every NTDC intern and is integral to making D.C./Austin internship opportunities possible for many UNT students. Additionally, each intern receives a one-time scholarship that contributes to living expenses. Every NTDC intern is awarded this scholarship, which is dispersed in cycle with other financial aid.